She plans to work for an NGO. She wanted to be of service to the world, but she also wanted to feel empowered in her job. Ah, antiquated. 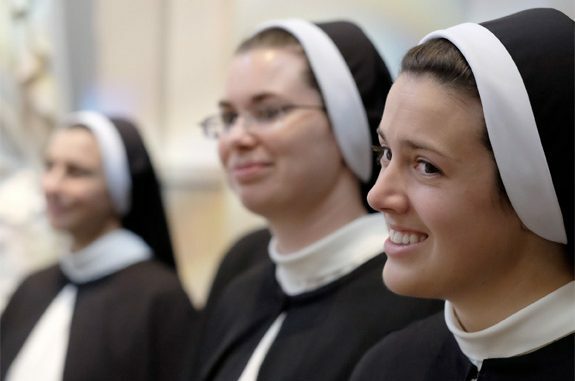 Without any sense of the ironic juxtiposition, the TIME piece then states: “Nuns are dying out because their population is aging and young women are not joining their ranks in the numbers they once did.” Funny how the Faith continues but people die. That’s something to ponder, isn’t it? Perhaps the author should have spent more time trying to connect the dots rather than score cheap and superficial political points. If Catholic nuns are to survive in this country, something has to give. The Vatican needs to treat the nuns with more respect. The rules will have to evolve. Women will need to be given more power and leadership roles in the church. because the leaders of these orders want to change the nature of religious life. These orders have about 80 percent of the sisters in the United States, and their leaders tend to belong to the Leadership Conference of Women Religious—the LCWR. These change-oriented orders claim to be “birthing new forms” of religious life with a sociological rather than ecclesial focus. Many of them profess a mission of liberating oppressed people and caring for the earth. Most of these orders have distanced themselves from the Catholic Church in terms of relations with the hierarchy, liturgical practices, and even on some theological/doctrinal matters. The orders of sisters in this category are in worse shape than in 1997 because their ties to the Church have become strained and fragile, and their identity has become blurred. In many cases, community life is nonexistent except in retirement homes, and prayer often is an individual practice. Many change-oriented orders also have severe financial problems, for their median age is well into the 70s, so they have far fewer working sisters than retired sisters. With a large elderly population, their numbers are dropping rapidly, and the few new vocations they do get tend to be middle-aged women. And, in short, that has been going on since the late 1960s, especially among the leadership of the LCWR, which is, as Carey rightly notes, “post-Christian” in every possible way. The second category I call “classic” religious orders because they live that classic definition of vowed, total, permanent commitment to Christ and his Church, and they share a common life with regular common prayer. These orders have about 20 percent of US sisters, and their leaders tend to belong to the Council of Major Superiors of Women Religious, the other group of sister leaders. These classic orders are in a stronger condition than 1997, for they have maintained their identity through close ties with the Church, a corporate apostolate, and life and prayer in community. Many of them have grown in the last 16 years. Consequently, they have a lower median age due to their success in attracting young women to join them, so many of them have more sisters working than retired. Recent studies prove that young people are more attracted to the classic orders because of their orthodoxy, distinctive religious lifestyle, and the quality of their prayer life, which usually includes practices such as chanted office and regular hours of Eucharistic adoration. The purpose of the religious life is to help the members follow Christ and be united to God through the profession of the evangelical counsels. It should be constantly kept in mind, therefore, that even the best adjustments made in accordance with the needs of our age will be ineffectual unless they are animated by a renewal of spirit. This must take precedence over even the active ministry. … Let all religious, therefore, rooted in faith and filled with love for God and neighbor, love of the cross and the hope of future glory, spread the good news of Christ throughout the whole world so that their witness may be seen by all and our Father in heaven may be glorified (Matt. 5:16).